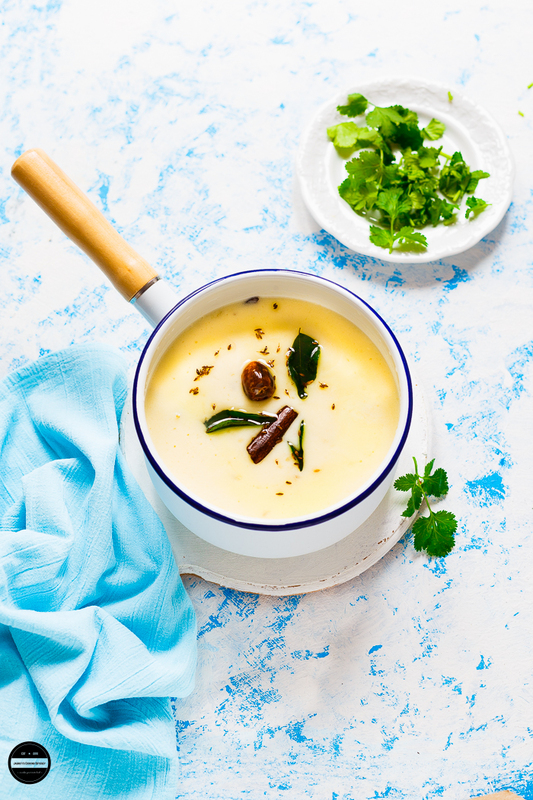 Jagruti's Cooking Odyssey: Gujarati Kadhi - Seasoned Yogurt and Gram Flour Soup ! Kem Cho? 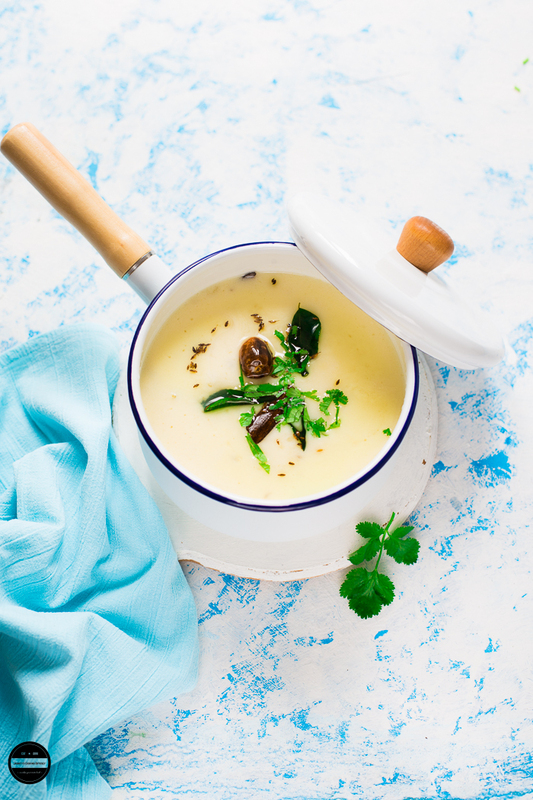 Gujarati Kadhi - Seasoned Yogurt and Gram Flour Soup ! Kem Cho? Two-three weeks back we were invited by our family friend to a dinner and dance party, after 12 at midnight it turned into a night club ;). It was my friend's 50th birthday! We had a nice time there, met few other friends too. As usual, I always ended up in foodie conversation, and I mentioned my blog to them. One of my friend Ranjanben mentioned to me that she likes particularly "KADHI" made by LOHANA GUJARATI, which I am. She asked me if I can make this recipe and post it on my blog for her. I did promise her that soon I'll make it and post it on my blog, so here I am with Gujarati Kadhi! 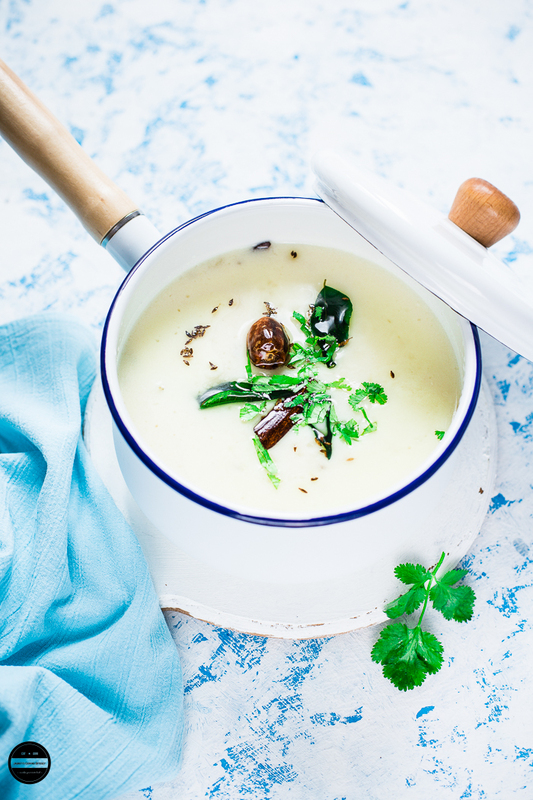 Gujarati Kadhi is one of my favourite dishes since I was little girl and appears frequently on our dining table, especially I love to pair this kadhi with Tuver-Gungo or Pigeon Pea Curry or Black Chick Pea Curry , hot steaming rice. Easily I could gulp down couple bowls of this. I find this combo so delicious and comforting! In Gujarati Kadhi we do not add turmeric. If you really want to experience an authentic taste of this kadhi then make vaghar with ghee. Gujarati Kadhi, is a yogurt based soup. Gujarati Kadhi is thinner than Punjabi kadhi, mildly spiced, sweet-sourness that is typical of Gujarati cooking. This kadhi is great to eat with plain rice or khichdi. Mix gram flour, yogurt and 3 or 3 1/4 cups of water....mix with the hand blender and make a very smooth paste. Add CG paste, curry leaves, jaggery, salt and put on a low flame and bring it to boil.please do not boil for a long time but to simmer it on a low heat for a lesser time.Meanwhile, prepare heat ghee and oil in another pan, add cumin seeds when they splutter add hing, cloves, Cinnamon stick. red chili and methi seeds.Fry for a few minutes and then pour over the kadhi. Boil for a few minutes more. Garnish with fresh Coriander leaves.Enjoy! My mom always makes Kadhi with Kichdi.. LOve the flavour and aroma thats comes while cooking it! i love kadhi.....just need some hot rice1!...yum yum! New and unique dish. Looks creamy, yummy and mouth watering. Lovely presentation. Yummy and delicious kadi.Love to have this with rice. I simply love kadhi and infact I make it daily. This gujrati kadhi looks delicious. Such a comforting kadhi, feel like having some with rice and pickles.. Perfect Kadhi for this cold weather we are having. Hope I m right... ? Lovely... and quite a tummy soother.. Different and yummy soup..looks delicious and comforting. Mmm I've never heard of soup made like this before, with the yogurt. Sounds tasty. creamy and delicious Kadhi, just need a hot phulka to finish it. One of the reasons i loveee Gujarati food is not only the deliciousness but the addition of a bit of sugar in savoury dishes which we always do! i even like added sweetness in a fried rice,lol! And i sure do loveee Kadhi , it is something i relish and there so muc of variation! Yummy looking dish! 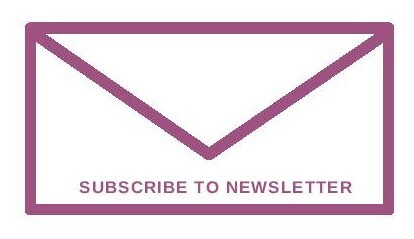 Oh, please go to my blog to claim your Stylish Blogger Award. It was given to me by another fantastic blogger, Elisabeth and one of the rules is to pass on to other bloggers whom I think are fantastic and you are one of them in my list. Thanks again for sharing with us all the wonderful stories and recipes. HUGS! I really enjoyed this kadhi a lot. The flavours that cloves and cinnamon gave the kadhi was wonderful. Even my FIL enjoyed it!! Thanks a lot! Oh I bet this is great! complimenti una zuppa super e adorabile.bellissima foto e anche complimenti per il blog! Wow..Gujarati Kadhi...Its a regular in our house..with Khichdi..Its my hubby's fav..I grew up eating punjabi pakodewaali kadhi..and learnt this after we got married..and making it since then..As you know its such a quick and easy meal and very comforting...Love ur clicks...Happy Holidays. Hi Edyta, you can find all these ingredients in a Indian grocery shop. In UK you can find even in main superstores like Tesco, Asda etc..hope you can find them. your photos are gorgeous! This definitely looks like something I would enjoy. This looks so tasty, can't wait to try it! What an interesting soup. I've never heard of most of these ingredients. I need to finally try my hands at this! Pinning to try later. I'm going to try this tonight and share a pic with you if it turns out well. I love kadhi anyday. 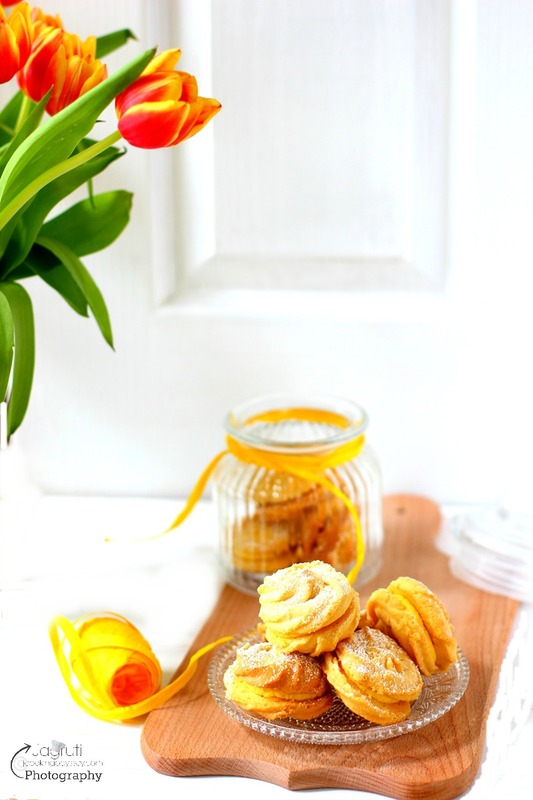 I am in love with this recipe and it's name too ;) looks so creamy and Delish! Yummy and delicious kadhi. would love to have this with rice. Lovely kadhi, it is really a comfort food for me.